[S30] Nominal Roll, Australian War Memorial - WWII, http://www.ww2roll.gov.au/, Date of Birth 7 Jun 1916 Place of Birth LONDON, ENGLAND. [S30] Nominal Roll, Australian War Memorial - WWII, http://www.ww2roll.gov.au/, Date of Birth 25 Jan 1893 - Place of Birth WARRENBAYNE, VIC. [S2] Registry of Births Deaths and Marriages Federation Index Victoria 1889-1901 "registered at 'Badd' as Charles Fred Gor." [S39] Index of burials in the cemetery of Fawkner Memorial Park, online @ http://www.gmct.com.au/deceased-search/ "Ashes scattered on request." [S11] Newspaper - Argus 20 Nov 1924, p1. [S12] Newspaper - South Bourke and Mornington Journal 7 Sep 1904, p2. [S30] Nominal Roll, Australian War Memorial - WWII, http://www.ww2roll.gov.au/, Date of Birth 31 Mar 1927 - Place of Birth FITZROY, VIC. [S25] School Records - Beaconsfield North 2560: at school from 24 Jan 1932, Mrs M A Rogers, UB, Domestic Duties, no previous schooling, left 28 Mar 1941 for home. [S80] Ancestry - Family Tree, colvin (judithgreen31). [S18] Newspaper - Pakenham Gazette "6 Jul 1956, p1." [S185] Property Titles. ; PROV (Public Records Office Victoria), C/T 7615-058 - C/T 8239-962 - Bruce Rogers of Beaconsfield Upper Greaser. [S185] Property Titles. ; PROV (Public Records Office Victoria), C/T 8266-956 - Bruce Rogers Assistant Fitter and Irene Joan Rogers Married Woman both of Upper Beaconsfield - joint proprietors. [S185] Property Titles. ; PROV (Public Records Office Victoria), C/T 8266-956 - Bruce Rogers of Emerald Road Upper Beaconsfield Gentleman is now the proprietor. [S35] Probate Records, PROV (Public Records Office Victoria), VPRS 28/P8, unit 400; VPRS 7591/P4, unit 734. Posting at Discharge A A P C C P M SEC (ME). address is incorrect on electoral roll, as Shenfield Avenue is at Carrum, where they resided previously. (electoral 1942)." [S30] Nominal Roll, Australian War Memorial - WWII, http://www.ww2roll.gov.au/, Date of Birth 15 Mar 1909 - Place of Birth SOUTH MELBOURNE, VIC. 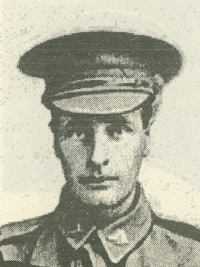 Thomas Frederick Barnett enlisted on 23 Jul 1915, when he was 28 years old and working as a carpenter. He was married with two children, with a third on the way. He embarked from Melbourne on 3 Jun 1916 on board HMAT A34 Persic. He enlisted as a driver with the 22nd Company, Australian Army Service Corps and was promoted to Corporal. He returned to Australia on 11 May 1919. SERN 10803. 5 Jun 1911, FLIGHTS FROM FIRE. ESCAPES BY NIGHT. DRESSING IN THE BUSH. [S19] Newspaper - Berwick Shire News and Pakenham and Cranbourne Gazette "2 Nov 1910, p2." [S185] Property Titles. ; PROV (Public Records Office Victoria), C/T 3512-298 - Mortgage No 362354 - Ellen Trickett - discharged 12 Nov 1919. [S185] Property Titles. ; PROV (Public Records Office Victoria), C/T 3512-298 - Alice Maud Barnett of Beaconsfield the wife of Thomas Frederick Barnett. [S185] Property Titles. ; PROV (Public Records Office Victoria), C/T 3512-298 - Thomas Frederick Barnett of Beaconsfield Builder and Contractor. [S185] Property Titles. ; PROV (Public Records Office Victoria), C/T 3512-298 - Mortgage No 402769 - discharged 8 Sep 1920. [S185] Property Titles. ; PROV (Public Records Office Victoria), C/T 3343-442 - Samuel Barnett died on 26 Aug 1928. Probate has been granted to Thomas Frederick Barnett of 277 Dandenong Road Carpenter and Florence Mabel Gamble of 16 Hilda Street Married Woman both of East Malvern. [S35] Probate Records, PROV (Public Records Office Victoria), VPRS 28/P4, unit 2199; VPRS 7591/P3, unit 349. [S11] Newspaper - Argus 5 Jun 1911, p6.